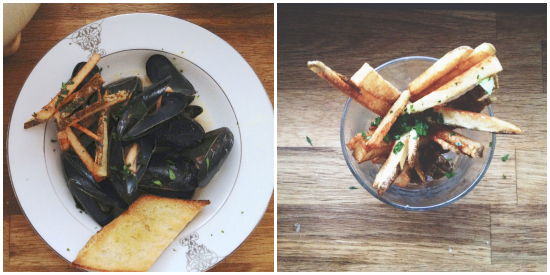 The antidote to any long week is a pot of glossy, steamed mussels dripping in garlic and wine. 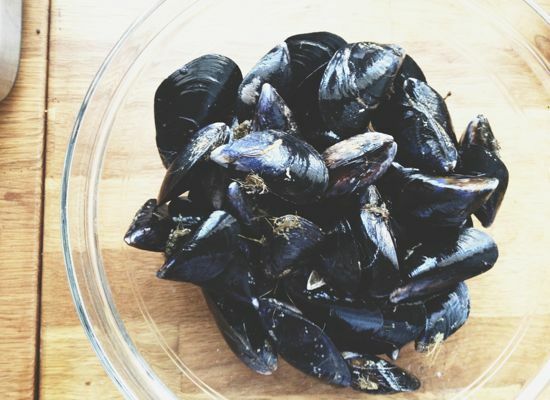 It's one of summers simple pleasures, and while the mussels themselves take a small amount of work to prep, they basically cook themselves quickly in a warm bath, emerging plump and tender, ready to be spread on a piece of grilled bread. The beach, hopefully a place many of us will enjoy this season, is our location. We arrive already planted in the sand, with the sun overhead, lifting above the clouds and the sea. I love what comes next: "the silence is divided by small waves." It reminds me of laying on my stomach, a hat covering my face, just drifting off. The sounds begin to overlap, my skin is warm, and maybe I've even dozed off for a minute or two. In this poem, there is the burned wood, sea-snails singing, children screaming: all sounds of a lazy afternoon that Williams collects in this poem like shells in a plastic bucket. I usually make mussels with white wine, but after reading the post by La Domestique, decided to give rose a try. It's a nice spin on this summery meal. 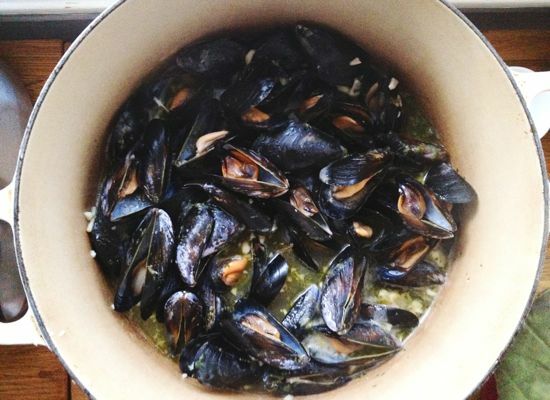 To prepare the mussels, immediately unwrap them when you return from the store and place them in a large bowl in the refrigerator. This will allow them to breathe. 20 minutes before cooking, fill the bowl with cold water and let them sit. They'll open a bit, releasing any lodged sand, and should close again before cooking. The final step is removing the beard, the fibrous threads attached to their shells. In a large Dutch oven, heat the garlic with a bit of oil over medium heat. When the garlic is fragrant, add the flour and butter and whisk until no lumps remain and cook for 1-2 minutes. Sprinkle in the parsley. Add the wine and let boil for about 3 minutes, or until the sauce thickened slightly and some of the alcohol has burned off. Add a pinch of salt, too, so the broth will be flavorful. 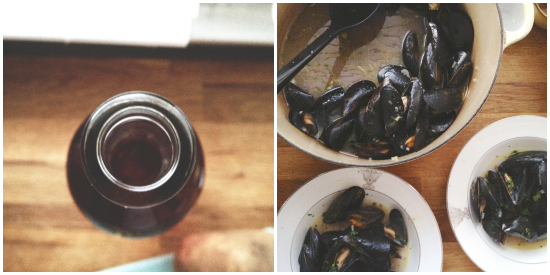 Gently pour in the mussels and nestle them around so everyone is comfortable. Cook uncovered for about 7 minutes, or until all the mussels have opened. Spoon into low bowls with plenty of broth, and serve grilled bread alongside.